Mixed Bag Fundraiser-Orders due Friday 10/30/15! We're nearing the finish line for our fall fundraiser. Orders are due this Friday 10/30/15. We'll also have a table with product display and ordering available at the Halloween parade. Where can I get extra order forms or a catalog? What is our fundraiser ID? Do we include payment $$ with orders? Yes, please include payment at time of order. Orders without payment will not be submitted to Mixed Bag. Payment can be made by cash or check. Who should checks be made to? When will the orders be delivered to students? We hope to have items to students before Thanksgiving break. If not then, for sure the first week of December. Will products be shipped to people who order or will they be given to students? The products ordered by catalog will be delivered to the students for direct delivery. If purchasers would like to have items shipped directly to them, they can order online. We get a slightly lower percentage (40% for online sales, vs. 50% for catalog) but it may work better for out of town supporters. Be sure to tell people to enter your child's name and our fundraiser ID when shopping online or we won't get credit. Our ID is 341604. If there is a product I saw on the Retail site but that is not available in the Fundraiser Catalog, is there any way I can order it? Yes. You can order it through the fundraiser order form. Please note that we cannot guarantee the availability of items not in the Fundraiser Catalog. You can also order online through the store - just be sure to reference the organization's Fundraiser ID# during checkout or at the top of any of the store pages. The order will be shipped directly to you and the organization will receive 40% credit for your order. How is top seller determined? 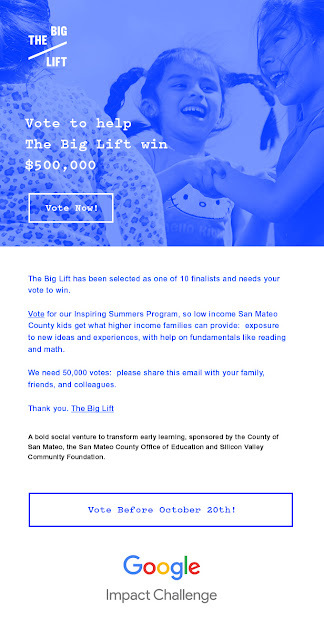 Top seller will be the student who raises the most money combining online and catalog sales. They will get all the prizes based on their earnings from the Minions prize form plus a $150 Target gift card! What other prizes are offered? Kids will earn prizes based on the amount of money they raise from the Minions Prize form. For example, if they get up to Level H (sell $500 worth of products) they will get the prize for H plus all the prizes below: selfie stick, plush minion, bottle hoodie, flying monkey, hang glider, key chains, stretch slime, minion key chain. The highest prize on the Minion prize sheet is 3D pen! Kids who get to that level will also get all the prizes below including a tablet and the remote control Minion! 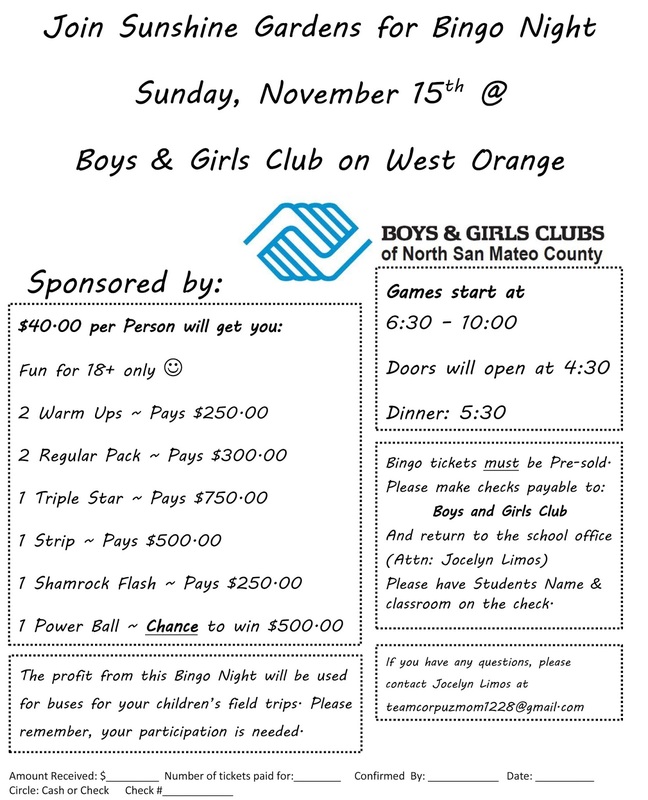 The PTA is offering additional prizes! We will hold a drawing at the end of the fundraiser. For every 3 items of any price sold you will get 1 entry into the drawing. We hope all will participate and sell just 1 item to earn the teachers a $100 gift card. Thank you to our judges: Superintendent Moore, the SSFUSD Board of Trustees and Principal Dye. 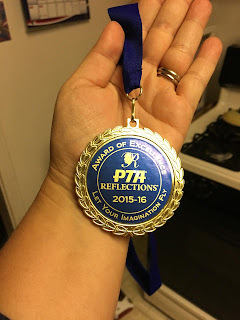 All participants will be recognized and winners will be announced at our November 5th PTA Meeting. Thank you to everyone who attended the show and participated! 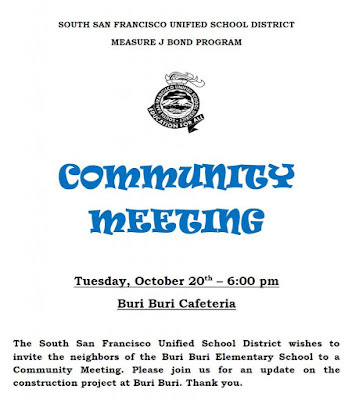 Buri Buri has some of the most talented students in SSF! Please mark your calendars for our Multicultural Potluck Dinner and PTA Meeting! 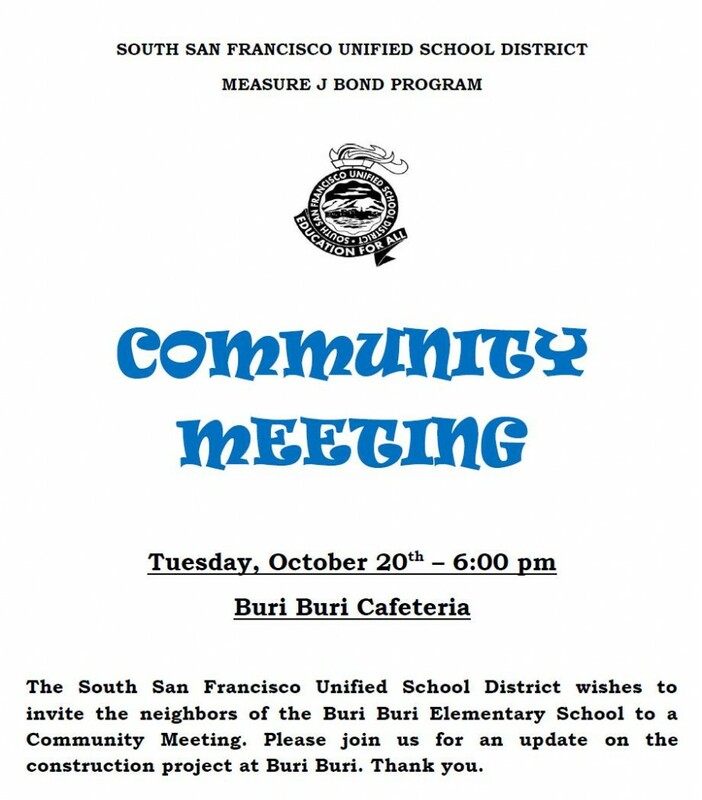 Thursday November 5, 2015 at 6:30pm in the Buri Buri MUR. 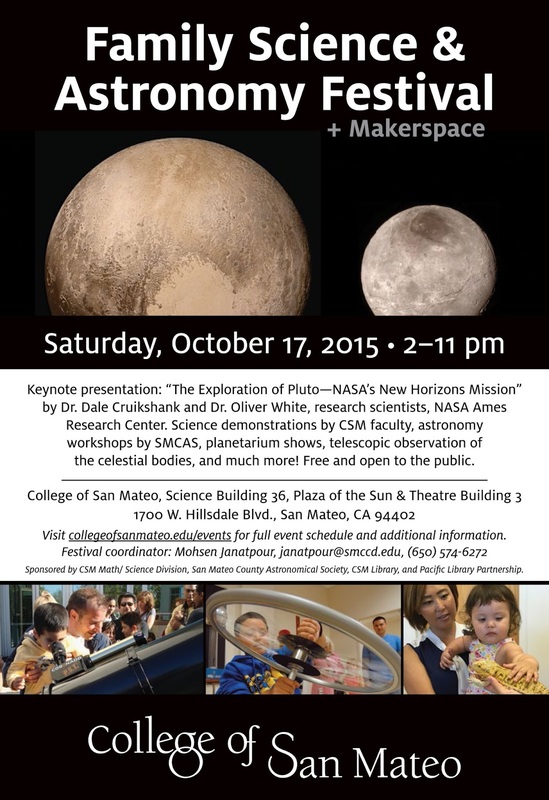 All are welcome, children and adults! Please bring a dish that represents your family heritage to serve about 10 people. 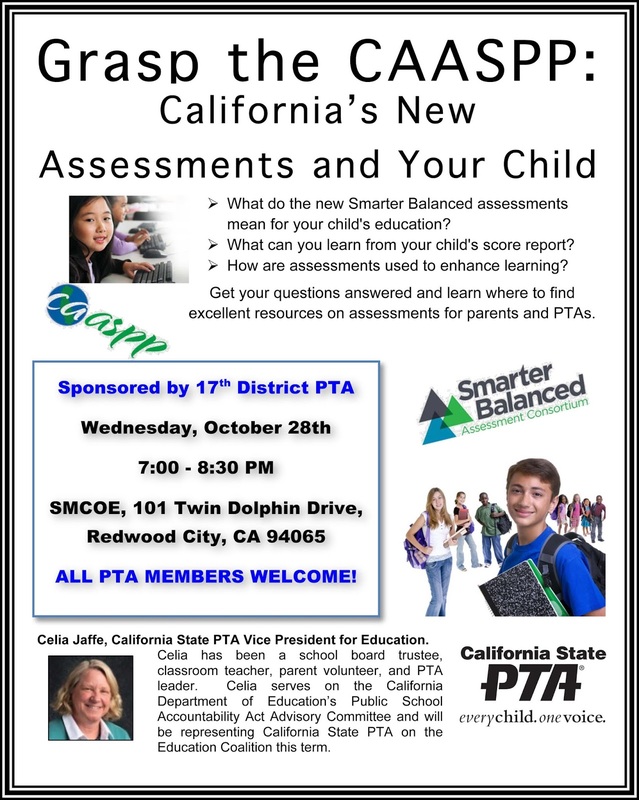 During dinner we will have a short PTA meeting and Mrs. Dye will give an update about our school's recently released test results. You should have received your student's test scores in the mail this week. Also, the Reflections artwork will be on display! Don't forget Reflections entries are due Monday. Also, shop at Amazon through our link. Reflections Art Contest-Deadline Extended to Monday October 19! 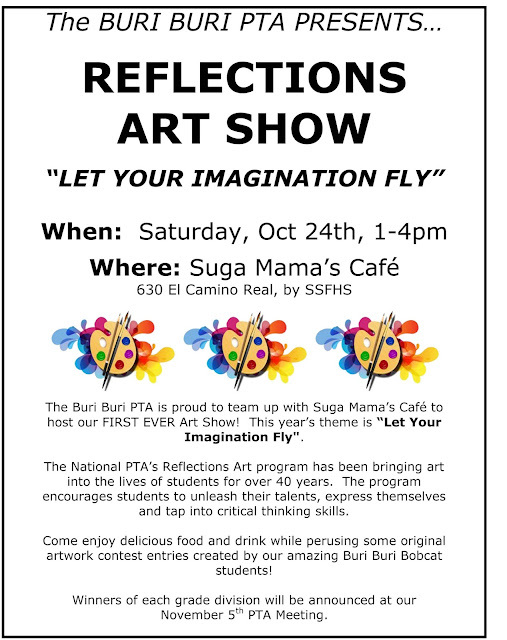 Additionally, we are excited to announce that we are teaming up with Suga Mama's Cafe on El Camino Real (near SSFHS) to host an "Art Gala" on Saturday, October 24th from 1-4pm where we will displaying all of the contest entries! Come by and see your student's artwork hanging on the walls while sipping some delicious coffee and munching on some scrumptious goodies. 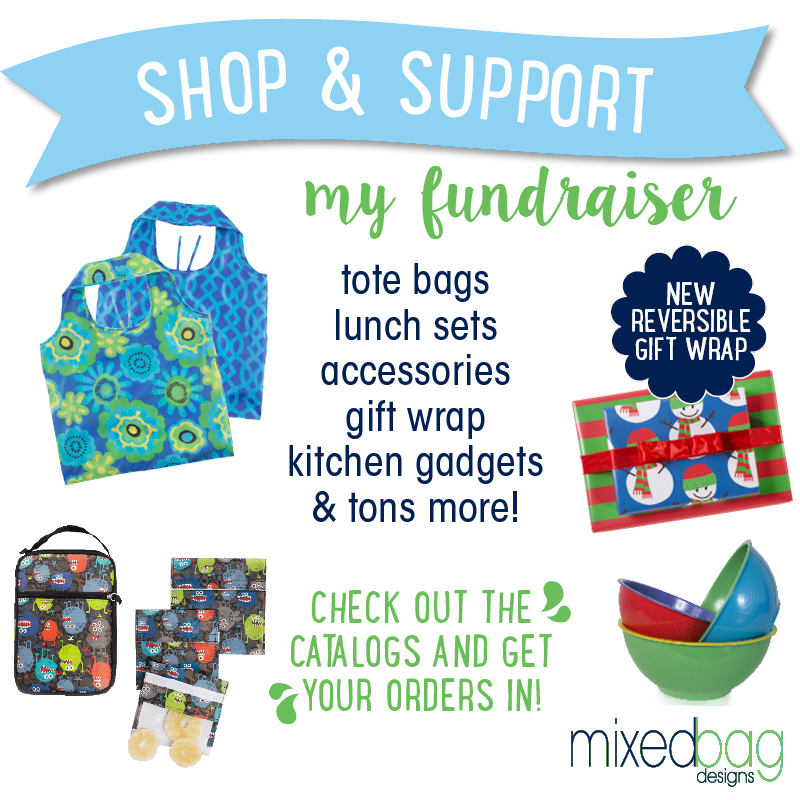 Don't forget to support our fundraiser: Mixed Bag Designs! Sales open through October 30. 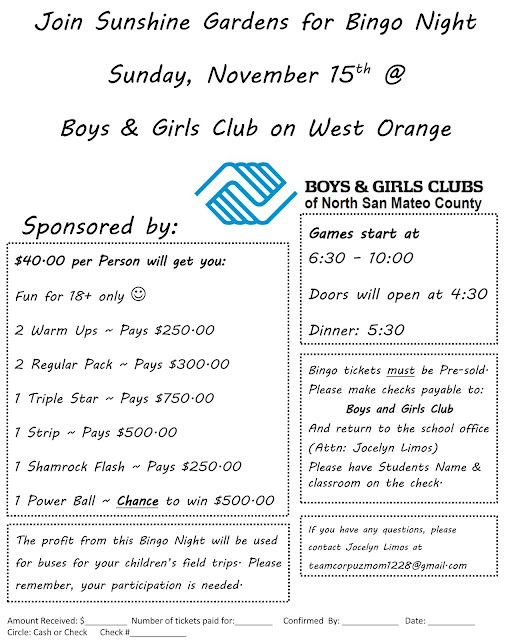 It's time for our fundraiser! We sent the catalogs home yesterday - check it out and review the attached letter for all the details. Our goal this season is $10,000 and we can't make that happen without everyone's support! We are hoping to fund our many excellent PTA events and programs. All funds over our budgeted costs will be donated to back to the school. Last year we donated a very large amount to help pay for the crossing guard, field trips, and enrichment programs. Help us get us to our goal - it's really easy and we've got some great products this time around! We hope everyone will sell at least 1 item at a minimum to earn all the teachers a $100 gift card. Share the catalog with everyone you know - it has something for everyone! You can sell items by catalog or online! Buri Buri will get 50% of sales for catalog orders and 40% for online sales. 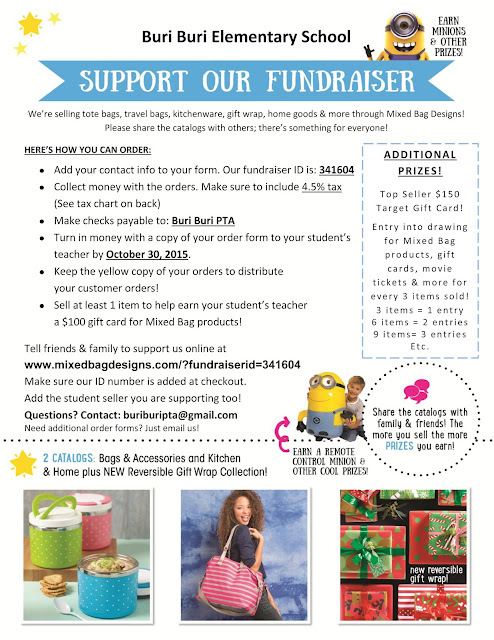 The online link is: www.mixedbagdesigns.com/?fundraiserid=341604 Be sure to enter the name of student you are supporting. Please let me know if you have any questions and thanks in advance for your support! We couldn't do it without you! Hi All! 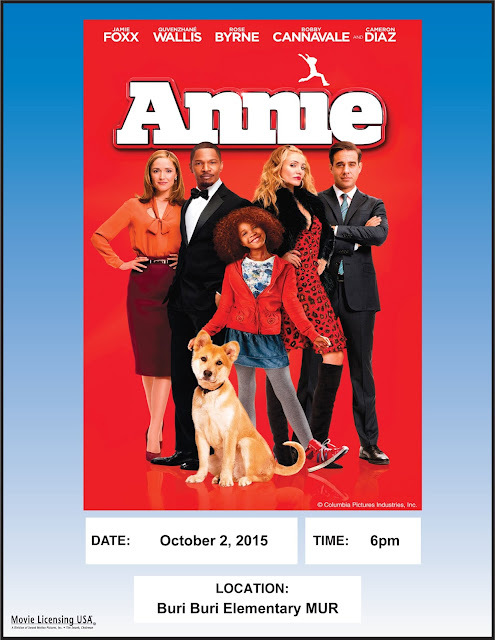 Here is an update, the movie will start at 6:30pm, doors will open at 6pm for all to get seats. There will be a sing-a-long before the show and all kids who attend will be entered in a raffle drawing! See you then! 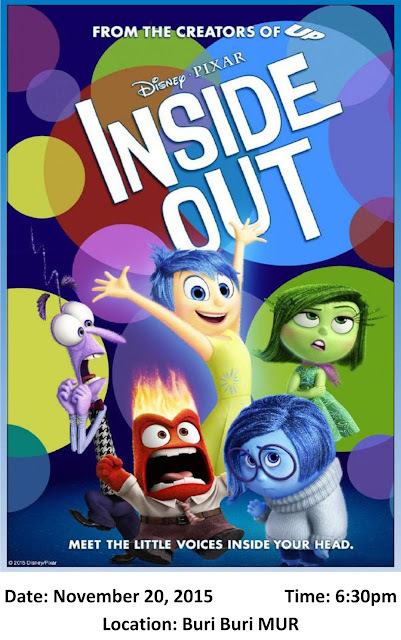 Please join us for our free family movie night this Friday 10/2/15 at 6:30pm in the Buri Buri Multi-Use Room! Doors open at 6pm. We're watching the new Annie. Bring chairs and blankets to sit on. Kids are welcome to wear their pj's. We will be selling pizza and popcorn too! See you then! Thank you for supporting Buri Buri! Shop on Amazon through our affiliate link! 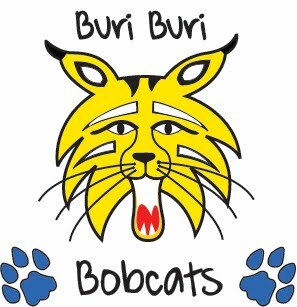 Every purchase you make will benefit Buri Buri PTA! It's easy and all you have to do is start here at our website to open amazon's page: Amazon! Then when you make a purchase, Buri Buri PTA will get $ from the advertising and it won't cost you a penny! So, as you're getting ready to start Halloween shopping and holiday shopping, don't forget to start HERE! Thanks! Come to Pieology on Gellert Blvd this Wednesday, 9/23 between 2-8pm and indulge in delicious pizza and salads and Piology will donate 20% of your purchase to the Buri Buri PTA. 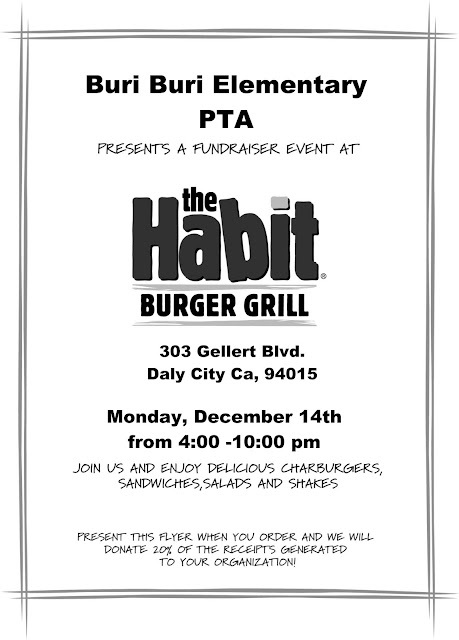 Dine-in or Take-out, just present this flier (or show simply show it on your mobile device) to ensure our school gets credit. You can even call your order in in advance and have it ready to pick up - check out their menu online: http://www.pieology.com/menu/index2.php Thank you in advance for supporting the PTA! PTA Reflections Art Program Contest Kick-Off! Did you know it is National Arts in Education Week this week? In 2010, the U.S. House of Representatives passed House Resolution #275 designating the second week of September as "Arts in Education Week." The resolution states: [...] Arts education, comprising a rich array of disciplines including dance, theatre, media arts, literature, design and visual arts, is a core academic subject and an essential element of a complete and balanced education for all students. Buri Buri PTA is celebrating this special week by kicking off our national PTA Reflections Art Program Contest! This year's theme is "Let Your Imagination Fly". 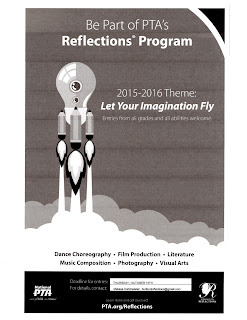 This week, a flier will be sent home promoting the Reflections Art Program Contest along with the Rules and Submission form. All entries are due by Thursday, October 15th. The contest is open to ALL Buri Buri students and we encourage EVERYONE to participate! 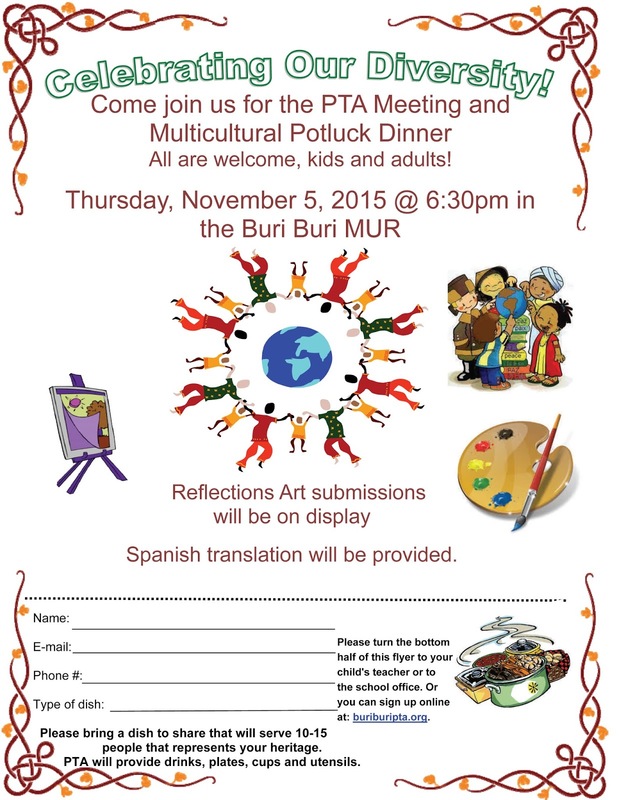 The Buri Buri PTA will celebrate and recognize ALL entries submitted for the contest. We are hoping to host a real life Art Opening at a local coffee shop in late October and will also be proudly displaying the artwork at our November PTA Meeting! Thank you in advance for supporting Arts in the school and for supporting your students desire and need to create and explore! If you have any questions, please email Melissa Kohlmeister at buriburireflections@gmail.com . Our membership drive is in full swing! We have 222 members as of 9/12/15! Thank you to all those who have joined the PTA :) We appreciate your willingness to join and support the PTA and all we do for our kids. We are having a little contest between the classes to see who gets to 100% member representation first. Mrs. Rivera's class is winning so far with over 70% of her students with at least 1 family member joining the PTA. The first class to 100% will win $250 to be spent as the teacher chooses. Classes that have the highest gains month-to-month will also win prizes like grab bag toys and drawings for gift cards for spirit wear and restaurant nights. Please join today! If you are not able to print the form, just include your name, email, phone number, student's name, classroom teacher and room number with dues payment.